Being a self confessed tan addict I always have to try every tan! 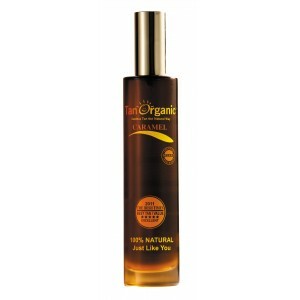 So thanks to the lovely people at Tanorganic I tried their fab organic tan. The tan is made from 100% natural products and is perfect for sensitive skin. The tan, as seen on Dragons Den, has won a ton of awards including Irish Times Best Value tan 2011. Having heard great reviews I had to try it out for myself. The tan comes in a fab glass bottles with a spray top and the tanning mitt is extremely soft. There’s absolutely no tell tale tan smell off the tan which is a plus! I put their TanArganic oil on my knuckles and elbows to avoid build up. I spray the tan directly onto the mitt and applied it just on the upper half of my body. As I love to be quite dark I put on 2 layers. And the best part is it only takes a few minutes to dry and there’s no stickiness at all! To avoid marks I threw on a baggy t-shirt and went to bed. The results were amazing! No yucky tanning smell and I had a fabulous even, natural looking golden tan. And there was no tan smell off it at all! It faded evenly and was easy to remove with exfoliating gloves and a scrub. The tan is available online at http://www.tanorganic.com/ or in stockists nationwide and is priced at a very reasonable €19.99 and the double sided mitt is €7.99. Definitely a must buy from me! Love love LOVE these wedges. Perfect for summer and can be worn with jeans or a cute little summer dress. Green is the new red according to Topshop heiress Chloe Jade Green. She launched her new shoe line CJG earlier this month and WOW they are fab! Bringing green soles in and throwing red soles out the window. The collection includes both heels and wedges and I’m loving all of them! All of the shoes are named after Chloe’s close friends and family. All of the shoes are available online or in Topshop stores. The wedges she has designed are especially my fave, they’re so summery and could be worn both casually and on a night out. All of the shoes are a bit more expensive than the usual shoes in the Topshop collection but would be the perfect excuse to splurge a little and treat yourself. Hope you all enjoy them as much as I did. Welcome to the crazy world of Meggan. Lover of all things pink, sparkly and Barbie. You’ll never catch me outside without my perma tan, eyelashes that reach the sky and extensions down to my bum! Love to talk about everything that girls love and try every new beauty product on the market. Well, I’m a Business and Irish student with a not so secret love of beauty and fashion. Living in Kildare although a Dub at heart. I love most sports (but just to watch!) especially rugby and go to most Leinster Rugby matches. Have the most wonderful boyfriend Jamey who I love to bits and pieces and a wonderful but very crazy family. My favourite song is Barbie Girl which is very apt to me and describes me perfectly. Once said I want to be a rugby ball but we all have our blonde moments, although I may have a few more then the general population but it wouldn’t be me otherwise. Although there is a lot more to me then many think. Love all my friends and would be nowhere without them.